SpaceX is scheduled to launch its ninth Commercial Resupply Services mission for NASA to the International Space Station Monday, July 18. Our continuous countdown coverage here on the Launch Blog and NASA Television coverage of the launch will begin at 11:30 p.m. EDT, Sunday, July 17. The SpaceX Dragon spacecraft is targeting liftoff on the company’s Falcon 9 rocket at 12:44 a.m. from Space Launch Complex 40 at Cape Canaveral Air Force Station in Florida, carrying science research, crew supplies and hardware to the orbiting laboratory in support of the Expedition 48 and 49 crew members. You can read more details about the International Docking Adapter, pictured, that will be carried into orbit during the mission here. As part of prelaunch activities, NASA TV will air a prelaunch briefing conducted by mission managers on Saturday, July 16, at 2 p.m. The briefing also will stream live on the agency’s website at www.nasa.gov/ntv. After a two-day trip, NASA astronaut Jeff Williams will use the station’s 57.7-foot robotic arm to reach out and capture the Dragon spacecraft as he operates from the station’s cupola. NASA astronaut Kate Rubins will serve as the backup. Ground commands will be sent from Houston for the station’s arm to install Dragon on the Earth-facing side of the station’s Harmony module for its stay at the space station. By the next day, the crew will pressurize the vestibule between the station and Dragon, and then open the hatch that leads to the forward bulkhead of Dragon. 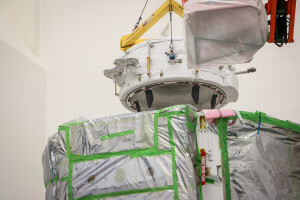 Live coverage of the rendezvous and capture July 20 will begin at 5:30 a.m. on NASA TV, with installation set to begin at 9:45 a.m.
During the next five weeks, crew members will unload the spacecraft and reload it with cargo to return to Earth. About five-and-a-half hours after it departs the station Aug. 29, it will splash down in the Pacific Ocean off the coast of Baja California.